The Orange County Sheriff’s Office rescued a yellow lab from a frozen pond this week. The deputies were called out to a home on around and upon arrival, they saw a large yellow lab standing in shallow water, up to his chest and surrounded by ice. The Lake of the Woods Fire and Rescue was called and two firefighters arrived with rescue equipment. A ladder was extended onto the ice and Firefighter Aaron Lovell donned an ice rescue suit. 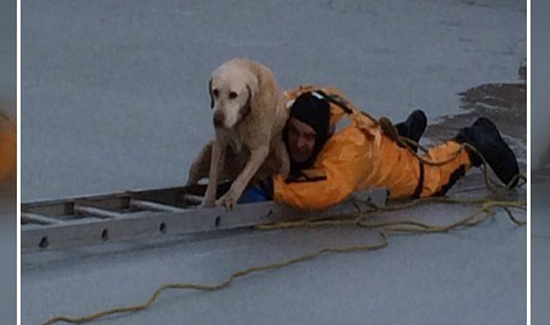 Lovell crawled onto the ice and pushed the ladder toward the dog. When the ladder tip reached the hole, Lovell crawled out the ladder toward the dog. As he neared the end of the ladder, the ice cracked and Lovell fell into the water. Fortunately, the water was very shallow and Lovell was able to grab the dog. Lovell helped the dog onto the ladder and firefighter Jeff Leibold and Deputies Broyles and Cutone, pulled Aaron and the dog to shore,” the Orange County Sheriff’s Office said on Facebook.